Welsh Highland Railway (ex South Africa Railway) Beyer Garratt NGG16 No.87 poses with Ffestiniog Railway locomotives at Porthmadog in a dress rehearsal for today’s golden spike ceremony. Picture is a still from a You Tube clip from a DVD available from the WHR. Yesterday, a short panel of track was laid next to the Ffestiniog Railway’s Porthmadog Station completing the £28 million rebuilding of the Welsh Highland Railway. Today’s ‘golden spike’ ceremony will mark the reconnection of the Ffestiniog and Welsh Highland railways and the creation of a combined 40 mile (64 km) 1ft 11½ (600 mm) gauge heritage railway running through some of the most stunning scenery in Britain. Our heartiest congratulations to the Festiniog Railway Railway Company, the Welsh Highland Construction Ltd, the Welsh Highland Heritage Railway and all those who kept the dream alive and turned it into reality. Today’s ceremony commemorates the completion of the UK’s, and arguably Europe’s, most ambitious heritage railway restoration scheme. But few, if any, of those attending today’s event will realise that they are also witnessing the completion of a volunteer-assisted railway restoration scheme that was the first ever such scheme to be proposed anywhere in the world. For it was some 70 years ago that a group of railway enthusiasts first discussed the possibility of forming a railway society and using volunteer labour to reopen and operate a closed railway. And it was the Welsh Highland railway, which had closed in 1937, which was the focus of their attention. With dark clouds looming over Europe nothing came of the idea at the time and most of the Welsh Highland railway track was lifted in aid of the war effort in 1941. In 1950, at a special meeting in Birmingham regarding the impending closure of the 2ft 3in (686) gauge Talyllyn Railway (TR), Owen Prosser, one of the enthusiasts who attended, recalled the volunteers formed into a railway society formula proposed before WW II for the WHR, and commended it to those seeking ways to keep the TR in in existence. The TR went on, under the leadership of Tom Rolt, its first general manager, to become the first line to be saved and restored by a railway preservation society. The now proven methodology, was successfully replicated to create hundreds of heritage railways all around the world. Returning to our tale of the WHR, after the 1941 track lifting, only the branch leading to the Croesor slate quarries remained, but that, apart from a few hundred yards, was lifted in 1948. One WHR locomotive, Baldwin 4-6-0T, 590 was cut up for scrap, another, Hunslet 2-6-2T, Russell, was put to work mining ironstone in Oxfordshire and a third, Moel Tryfan, remained in bits at the Festiniog Railway Company’ s Boston Lodge works only to be scrapped in 1954 to provide much needed funds to kick start the restoration of the FR. 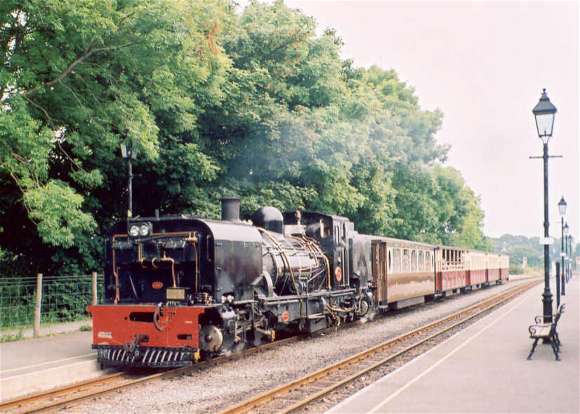 It seemed that the WHR was doomed and destined to be sold off as lots of little parcels of land – a fate that befell another 1ft 11½ railway, the picturesque Lynton and Barnstaple Railway in Devon. But it was not to be. The line’s particular legal status made it difficult for the line to be legally abandoned, even if the track was no longer present. Apart from some property at a couple of stations which were sold off by the receiver of the bankrupt pre-war company, the railway land remained intact, large sections becoming a unofficial footpath through some of the most attractive scenery in the Snowdonia National Park. In 1961, the Welsh Highland Railway Society was born and the campaign to rebuild the railway started in earnest. The early preservation history of the WHR is complex and contentious. Suffice it to say that the early WHR restoration pioneers had to deal with road ‘improvements’ which would have obliterated key sections of the line, a proposal to turn the line into a long distance footpath, a proposal to run a 12¼ inch gauge miniature railway over the most scenic section of the line and hostility from local residents and farmers. Finally, in the early 1990s, when at last the project to restore the WHR looked set to go ahead, the original WHR pioneers were faced with the decision of the then Transport Minister, John MacGregor, that it was not they, but the Festiniog Railway Company. who were to build the new Welsh Highland Railway. Eventually after a period of hostilities the two groups reached agreement. The original WHR group would concentrate on building up a heritage museum and their own short demonstration line at Porthmadog, and enjoy ‘running rights’ over the WHR ‘main line’. The main burden of negotiating for funds, restoring the railway formation and relaying the line would fall on the FR. The original campaigning group, whose name changed over the years – Welsh Highland Railway Society, Welsh Highland Railway (1964) Ltd, Welsh Highland Railway (Portmadog) – now trades under the name Welsh Highland Heritage Railway, while the FR manages the WHR under the brand The Welsh Highland Railway (Caernarfon). Detailed negotiations regarding WHHR running rights over the WHR are continuing, and we hope that the ‘feel good factor’ from today’s ceremony will spill over and assist both groups to negotiate a detailed operating agreement which will be of benefit to both parties. With the earthworks still fresh, the course of the rebuilt WHR can easily be traced on Google Maps. Why not start at Dinas Junction (see below) and trace the line of the railway back to Porthmadog? Temple to central planning, CMK railway viaduct at Baranow. Photo Tomasz Kuran, Wikipedia Commons. PKP S.A., the Polish State Railways holding company, is running short of money. Some experts reckon that the shortfall this year will exceed 2,000,000,000 PLN. The revenue side of the 2009 budget includes 683 million PLN, from the sale of a minority stake in PKP InterCity; 800 million PLN from the privatisation of PKP Cargo, and 620 million PLM from the sale of key development sites. None of these transactions are now likely to take place in 2009. Meanwhile, PKP Cargo is bringing forward a deficit of some 500 million PLN from 2005, Revenues earned by PKP PLK from freight carryings are sharply down. Finance Minister, Jacek Rostocki, is demanding the repayment of 2 billion PLN of outstanding government loans. Commercial debt repayments and maturing bonds are likely to cost the group some 900 million PLN in 2010 and 1.7 million in 2011. The combined effects of the global crisis and Rostocki’s determination to slash government support of new infrastructure projects will mean that, of the planned 700 million PLN infrastructure investments already planned and committed, less than a half will actually go ahead. Those in receipt of EU funding will receive top priority. Other projects, those to be financed from ‘own funds’, or those which were dependent on government support, will either be cancelled, or will only go ahead in a truncated form. In those cases where contracts have already been signed, PKP will become liable for compensation payments totalling millions of PLN. The picture at the head of this article shows the pillars for a bridge started in the 1970s. It was to carry the A2, Berlin – Moscow motorway which was to be completed in time for the 1980 Moscow Olympics. The location is about 12 km North East of Zyrardow. Here the motorway was to cross the northern section of the North- – South trunk railway, Centralna Magistralia Kolejowa, which was never completed. Click here for more photographs. The unfinished station at Warsaw Okecie Airport. Polish State Railways’ infrastructure company, PKP PLK, has just announced a tender for the construction of an 1.2 km underground link connecting the Warsaw Okecie Airport to the Warsaw – Radom line near Sluzewiec Station. This is yet another Polish flagship railway construction project that is running embarrassingly late. The original target date for the completion of the rail link was 2008/9. Now it appears that, even if the rail link is completed by the new target date of Q2 2011, the rolling stock to operate the new service will not be ready on time until Q4 2011 at the earliest. As yet Szybka Kolej Miejska (SKM), Warsaw City Hall’s chosen operator for the new rail link has not yet announced a tender for the rolling stock. All construction work at the airport seems to be jinxed. The new Terminal 2 was supposed to be completed in mid 2005. In fact, it was opened in stages from the end of 2006 through to 2008. Is this why one of the service roads at the airport has been officially designated ul. Gordona Bennetta? Leszek Walczak, SKM’s is not worried about not having his trains ready on time. Based on PKP PLK performance elsewhere and factoring in the Okecie Airport jinx he reckons that he can hold the tender process for the 13 new train sets in June this year and still have the trains delivered before the new link is commissioned! In January, PKP Cargo closed down the railway museum in Koscierzyna and put its 7 employees there on ‘gardening leave’ with 2/3 pay and notice of redundancy. The Skansen contains some 35 items of rolling stock, including the unique Pu29-3, the longest steam locomotive ever built in Poland. In addition there are many smaller exhibits: historical records, drawings and models. A brief description and some photographs of the larger exhibits can be found here. The Mayor of Koscierzyna has been negotiating with PKP with a view to the Town taking over responsibility for running the Skansen. This seems to be the best bet for safeguarding the future of the museum and its collection. However, in Poland the most straightforward of arrangements can become hopelessly complicated in execution. The rolling stock at Koscierzyna belongs mostly to PKP Cargo. (A few items belong to the national Railway Museum in Warsaw.) But the land that the museum is situated on is administered by PKP’s estate company, PKP Nieruchomosci. The latter can be notoriously difficult when it comes to giving anything away and are trying to negotiate a deal whereby the Town will take over the railway land in lieu of unpaid taxes. Such negotiations take time. The President of Zdunska Wola has been waiting for 6 years to conclude negotiations regarding the transfer of the ‘forgotten’ railway museum at Karsnice. The crisis at Koscierzyna has come about because, PKP Cargo has already closed the Skansen and is due to remove its security staff by Saturday! If no replacement security arrangements are put in place, the small exhibits will be destroyed by thieves and vandals on the first day that there are no security staff and it will not be many days after that before they start hacking bits of metal from the locomotives and rolling stock. We urgently appeal to all BTWT readers and supporters to write to the Andrzej Wach, the President of the PKP Group, warning of the dreadful devastation that will occur at the Skansen unless he intervenes personally to ensure PKP continues to provide security cover at Koscierzyna Skansen until responsibility for security can be taken over by the Town Council. Your letter should be copied to Julian Engelhardt, the Under Secretary at the Ministry of Infrastructure responsible for Railways, and also to Marcin Modrzejewski, the Mayor of Koscierzyna. With so little time left we would recommend sending your letters to Andrzej Wach by fax if at all possible. Sadly e-mails and their enclosures are but rarely read in the offices of Polish state-owned organisations. Warsaw to Berlin ICE ? An ICE-TD approaches Berlin Ostbahnhof. DB have proposed running the Warsaw-Berlin service with the 125 mph (200 km/h) diesel electric ICE-TD sets which will be released from their existing duties on the Berlin – Århus and Berlin – Copenhagen services in 2011. The line between Berlin and Warsaw is electrified, but at two different standards: 3kV DC in Poland; and 15kV AC in Germany. The use of diesel-electric trains neatly by-passes the need for expensive dual-voltage electric trains. The prospect of travelling between Berlin and Warsaw in 4 hours in an efficient German ICE train is an attractive one. The fact that this could happen a year ahead of 2012, in good time to debug any problems that could arise, before Poland’s co-hosts the European Cup surely makes the proposal a ‘no brainer’. So why is Krzysztof Celinski, who took over as chairman of PKP InterCity in January this year not too keen? It could just be that Mr Celinski wants to put some ‘clear blue water’ between the course that he is now steering at the helm of PKP InterCity and that steered by his predecessor Czeslaw Warsewicz. But there are also good reasons why the proposal is not such a good idea. In order to fast on existing tracks the ICE-TD trains need to tilt, but the tilting mechanism on the ICE TD (unlike the mechanism on the electric ICE T sets) has given trouble from the start. In fact the train works best with the device switched out which puts paid to a Warsaw – Berlin run of 4 hours. Another killer is that Warszawa Centralna station and the cross-Warsaw railway tunnel was designed from the start for electric traction and lacks the ventilation arrangements necessary to cope with diesel exhaust. Fortunately, PKP IC had a ‘Plan B’. By 2011 the company will have taken delivery of 10 Taurus/Huszarz ES64U4 Eurosprinter locomotives from Siemens. The locos have a top speed of 200 km/h, are multi voltage and should – given the completion of projected track improvements – be quite capable of delivering a Warsaw – Berlin time of 4½ hours. So should PKP IC dump the ICE TD proposal? For the Warsaw – Berlin service, almost certainly; but half a dozen train ICE TD train sets for services between Warsaw (Warszawa Gdanska) and Kiev, Lviv, Donetsk and Dnipropetrovsk in the Ukraine during the 2012 football championships could come in very useful. Who knows, if the sets were a great success they could afterwards be pressed into service between Cracow – Katowice – Wroclaw and Berlin until someone comes up with a better idea. Wreathed in smoke, HRH The Prince of Wales congratulates the team who built 60163. Still from BBC video. Their Royal Highnesses, The Prince of Wales and The Duchess of Cornwall, named 60163, the A1 Steam Locomotive Trust’s new £ 3 million steam locomotive, Tornado at York Railway Station this morning. During the ceremony TRH, met Mrs Dorothy Mather, the President of the Trust and widow of Arthur Peppercorn – the designer of the A1 class. The prince said that he had nothing but the greatest admiration for the team of people who for the last 19 years have been building the locomotive. A clearly delighted Mark Allatt, the Chairman of the Trust, enthused, You couldn’t get much better than this. It’s the ultimate accolade to have the Prince of Wales and the Duchess of Cornwall to name ‘Tornado’. After the ceremony, the Prince of Wales rode on the footplate of the locomotive as it pulled the Royal Train from York to Leeds Railway Station. While looking up the distance by rail from Warsaw to Berlin for another post. I came across a classic travel blog, The Great Train Trail by Tom Troscianko and his travelling companions. Tom wanted to try out the new Qinghai–Tibet railway, he also had a last duty to perform in memory of his mother who had grown up in Minsk, now in Byelorussia, but once part of the Polish-Lithuanian Commonwealth. What better way of ‘connecting the dots’ than by train! The journey from Bristol to Lhasa makes compelling reading. Here Tom writing about long-distance train travel and the difference between hi-tech and lo-tech trains. The journey started with trains that were slick, but did not have the feel of homes. Temporary conveyances, like planes or cars. It’s a whole different feel when you get beds in the compartment. The compartment becomes your home, for however long the journey takes. Like a home, you can choose to be sociable and leave the corridor door open, and the curtains drawn. You work out how to use the gadgets – the power outlets, the ceiling fan, the bed catches… and you get yourself organised. Power outlets are great, it means you can watch dvd’s on the laptop, write the diary, look at pictures. The bathroom on the Moscow-Irkutsk train, with its cold shower, was a real plus. But whether you have these refinements or not, you gradually adapt to your temporary home. For a while, you are in “messing about” mode. This lasts a few hours. You talk more, do stuff, get up, sit down, and generally fret around. After this period, you get more quiet. Read a book, doze, wonder whether to make a cuppa from the samovar (we have excellent Twinings tea and real coffee bags; also the powder soups from Waitrose are good). So, life acquires a routine. You occasionally go for a walk, see if there are people to chat to, check which loo has the sweetest smell. At some point, you may go to the restaurant car which has a kind of pub feel to it – more conversations with strangers, cold beer on request, various items of food. All the while, the vista unfolds outside – forests, lakes, cities briefly glimpsed. Like eye movements but this time it’s the world which moves! Then comes the night. Perhaps a drink in the cabin. Make the beds. Close the door, and perhaps lock it for that extra safe feeling. Watch the stars and moon outside. The occasional light. Snuggle under the clean sheets and let the train’s movement rock you to sleep. Technically, the feat of running these railways is formidable, and seems to put UK trains to shame. In our 10,000 mile journey there were no delays due to faults in track, rolling stock, or signalling. The climate is very harsh. In winter, LPG gas burners are used at points to stop them freezing. The approach to technology is very different. Everything is simpler, “clunky”, and easy to service. Small items may break, such as aircon systems or light switches, but the train remains viable. Much greater use is made of human labour. Each barrier-controlled level crossing has a guard who stands to attention with a marker in the “all clear” position as the train passes. Each station has a stationmaster who also shows the “all clear”. Trackside structures are simple, often locally built, and painted in the pastel shades (blue or green) used across the whole railway. Other than that, there is none of the product brand which is so ubiquitous in the UK. The low-tech, highly redundant, people-hungry approach is viable because of the low wages, I guess. But it represents a railway culture in which the train is respected (the standing-to-attention exemplifies this) rather than being seen as a marketing opportunity. Part of my views here may be driven by some kind of nostalgia, but whatever the reason, the railway to Asia is an amazing feat of engineering. If you like the above extract you might like to read The Great Train Trail in the order it was written. Here is the very first post. After you have read it click ‘June 2007’ scroll right to the bottom and read the posts from the bottom up. After you have read the June posts, scroll to the bottom again, click ‘July 2007’ and start from the bottom again. Enjoy! to restore a ‘plinthed’ steam loco! C62-2 4-6-4 Swallow class locomotive at Kyoto. Japanese railway enthusiasts take their subject no less seriously than enthusiasts in Britain or Poland and the demand for steam-hauled excursions are such that East Japan Railway Co. has decided to restore two ‘plinthed’ steam locomotives to working order. The railway company has set up an inspection team to check if several ‘plinthed’ locomotives are fit to be restored to running order. If all goes well, the locomotives could be running again from early 2010. JR East currently has two active steam locomotives, the D51-498, known as the Degoichi, and the the C57-180, nicknamed Kifujin, or Fair Lady. The D51, which belongs to JR East’s depot in Takasaki, Gunma Prefecture, is used for special trains. The locomotive has been too busy to handle all the requests it receives from event organizers. The C57, which has been in service since 1999, is used for steam-hauled seasonal services operated on weekends and national holidays between April and November on the Ban-etsu-West Line between Niigata and Fukushima prefectures. Some 52,000 passengers rode the train last year. It is so hard to get a ticket for the train that railway fans have been lobbying the company to improve the situation. Steam in Japan peaked in 1946 when Japanese National Railways, had 5,958 steam locomotives. Under JNR’s modernization project, most of the engines were scrapped, although some were donated to local authorities. Many of these are now seen on display in parks and other public areas. The team will collect information on the whereabouts of existing steam locomotives and inspect them to see if they could be restored to working order. Candidates for restoration include a D51-96 on display at the Usui-Toge Railway Culture Center in Annaka, Gunma Prefecture, as well as a C62 Swallow class locomotive, owned by the Hokkaido Railway Co. The 3ft 6in gauge C62s were used on the Tokyo – Osaka service, and one member of the class holds the Japanese steam speed record of 80 mph (129 k/h). It will take about a year to restore one locomotive and cost roughly 300 million yen (£2¼ million), including the construction of maintenance and storage facilities. Annual maintenance has been estimated at over 50 million yen (£380,000) per locomotive. Steam hauled specials are also operated by three other JR companies: the Hokkaido Railway, the West Japan Railway and the Kyushu Railway, as well as private train companies including the Mooka Railway, the Chichibu Railway, and the Oigawa Railway. This is the tale of the Salekhard – Igarka Railway or Stalin’s ‘Death Road’. The construction of this line, which was never completed, killed tens of thousands of its construction workers. Nearly all who worked on the railway were prisoners. Some 80 percent had been convicted ‘political’ offences. It was enough to have spent the war in a German prisoner of war camp, or to have turned up 15 minutes late for work, to have been classed an ‘enemy of the people’ and sent to the railway. On Stalin’s death in 1953, the building work stopped; some 100,000 people were released from the project, though not necessarily to enjoy their freedom, and much of the railway was abandoned. Proposals for a railway network in the far North of Russia date back to the 19th C. However, it was not until in 1943, that a survey of the Salekhard to Norilsk route was carried out, along the route. Then in 1947, a decision was made to build a a major port on the mouth of the river Ob and to link it to the existing railway to Vorkuta. In 1948, the first section of that line (also built by prisoners) had reached Labytnanghy on the bank of the Ob. While the railway was being built it became clear that the Ob estuary would be too shallow for the deep water vessels that the new port was intended to accommodate. In 1949, Stalin decided to move his new port to Igarka on the river Yenisey and to build a second railway from Salekhard (on the other bank of the Ob from Labytnanghy) to Igarka with the possibility of a further extension to the South-East to link with the Trans Siberian Railway. Work started in the spring of 1949 all along Salekhard-Igarka highway. Two ferries were ordered from abroad for the crossings of the Ob and the Yenissey. When the rivers were frozen solid trains crossed them on temporary embankments built from ice. Salekhard became the HQ for the administration of the work camps. Stalin set 1952 as the completion date. There were shortages of materials and machinery. Most of the work had to be carried out hand. The only commodity that was not in short supply was prisoners and the work camps were ‘topped up’ with new prisoners at the rate of 5-7,000 per year. In winter, frosts dropped down to minus 60° C, blizzards struck down people and blew down buildings. Swarms of gnats and mosquitos attacked prisoners and guards. Conditions for prisoners were appalling. Life was cheap and beatings and far worse was common. The progress demanded by Stalin was achieved at enormous human cost. In the time made available it was also impossible to engineer the line properly. The consequences showed up fast: bridges collapsed, melt and rain water washed out embankments, bogs swallowed the railway track. In 1952, work on the project slowed. People and resources were allocated elsewhere. Construction was stopped completely in 1953 after Stalin’s death. A total of 434 miles (699 km) of railway had been completed at an official cost of 260 million rubles, later estimated to be near 42 billion 1953 rubles (about US $100 billion today). Only the Salekhard – Nadym section was opened. Further East, 11 steam engines and many items of rolling stockwere abandoned in the tundra. Until 1976, the phone line established by the railway builders along the intended track of the line from Salechard to Igarka remained in use. About 350 km of track between Salekhard and Nadym was operated from the 1950s to the 1980s. However in 1990 the line West of Nadym was closed and the first 92 km of railway to the East of Salekhard was dismantled shortly thereafter. First of all a sincere apology to all our readers. It’s not often that BTWT gets a story seriously wrong. If we get a lead, we always try to get a second source on the story. In many cases we write about developments that we have been tracking for some time. In many cases we have contacts who are on the ‘inside track’ and who can provide further confirmation. In the case of the story about the Rewal n.g. railway, in our haste to bring you another exclusive scoop, we cut one corner too many and didn’t talk to our local stringer. We had been tipped off about the project in 2007 and had been following developments since then. But, what we did not know was that the chairman of the gmina Rewal (local municipality) had been persuaded that his narrow gauge railway was just a minor tourist attraction and that what he should be creating in the old stations were major attractions like art galleries, café’s or even holiday accommodation. He was also more than a little miffed that none of the neighbouring local authorities had expressed any interest in joining his project. We now know that the first phase of the project – which is the only part for which funding has been committed – will be strictly confined within the boundaries of gmina Rewal. The project envisages: the relaying of only 6 kilometres of track between Pogorzelica and Trzesac; extensive renovation of the existing station buildings at Podgorzelica, Niechorze and Rewal (in the computer visualisations the old station buildings are are almost unrecognisable); and building new station buildings, in a similar style, at Sliwin, Trzesac and Niechorze Latarnia. The restoration of the link to Trzebiatow would be part of a possible latter phase as would be the building of a skansen, (an open air railway museum) at Podgorzelica. The latter proposal puts a serious question mark on the long-term future of the line to Gryfice! The first stage of the project does not include the restoration of any rolling stock nor does it contemplate the acquisition of a steam locomotive. The railway’s current steam locomotive, Px48-3916, is on loan from the National Railway Museum. For those interested in seeing what the first part of the project will achieve here are the links to the computer visualisations prepared by the project’s consultants, Ingeno Consult BPK Sp. z o.o. My sincere apologies to all readers for the inacuracies in the previous article. Lxd2-472 at Niechorze, train from Rewal to Pogorzelica. A 34 million PLN project to rebuild the narrow gauge railway between Gryfice and Trzebiatow as a major tourist atraction has been launched by the Municipality of Rewal. The railway links many of the the holiday resorts of the Municipality such as Trzesacz, Rewal, Sliwin, Niechorze and Pogorzelica with the PKP main line system at Gryfice. As well as completely rebuilding the track; the project envisages restoring the station buildings, fitting Victorian ‘retro’ style station canopies and lighting; and providing enhanced facilities for tourists, such as cafes, museum galleries and cycle hire. A damaged bridge will be rebuilt and trains, which currently terminate 15 km short of Trzebiatow at Pogorzelice – will once again work through to the end of the line. Many narrow gauge purists will see the plans – with their Victorian style ‘retro’ accoutrements as way ‘over the top’, but the new railway is expected to work for a living and attracting more tourist visitors into the area. It is a fact of life that the average tourist is more interested in keeping the kids amused and keeping out of the rain than historical accuracy. Perhaps the project, which has some 13 million PLN coming from the EU, may encourage other other Polish local authorities to invest in their own narrow gauge lines? The Gryfice Narrow gauge Railway is a fragment of the once extensive Pomeranian Narrow gauge railways – a network of metre gauge railways which once ran in ‘the top left hand corner’ of Poland. The system at its height comprised 555 route miles which survived almost in its entirety until 1989. Closures followed step by step until, like all PKP narrow gauge lines, the remains were ‘dumped’ by PKP in 2001. The 55 km section of line between Gryfice and Trzebiatow was taken over by the municipality of Rewal who set up their own operating division to operate 40 km (25 miles) as a tourist railway. Robert Skraburski, the chairman of the of the Rewal Municipality had hoped that neighbouring local authorities would join in the project and that more of the former Pomeranian narrow gauge railway network would be revived. Sadly, apart from the municipality of Trzebiatow, the other local authorities seem more interested in cycle paths than railways. The Pomeranian narrow gauge railway system will feature in an special article by BTWT guest writer Robert Hall which will be published during BTWT’s first birthday celebrations in March. Warszawa Gdanska seems a rather ordinary run down suburban station. The station building is the fourth to stand on the site. The first was completed in 1889 and burnt down by the Russians as they retreated from Warsaw in 1915. The second was blown up by the Germans as they retreated from Warsaw in 1945. The third station building was opened in 1959 and was the first permanent station to be built in Warsaw. It burnt down in 1984. The present building was constructed from the burnt out shell of the third station, with an extra floor added to the original single storey. Until Warszawa Centralna station was opened in 1975, all international trains stopped at Dworzec Gdanski, the name used by Warsaw residents for the station. Through coaches worked to such exotic locations as: Vienna, Prague, Paris, Brussels, Ostend, Moscow and Leningrad. Even London was served by a set of coaches that ran to Hook of Holland and, via the Harwich ferry, connected with the return Hook Continental to London’s Liverpool Street Station. Arist’s impression of the new station. PKP Polskie Linie Kolejowe (PLK), the PKP infrastructure company prepared an 86 million PLN plan to rebuild the station. The main objective of the exercise would have been the to increase the capacity of the station some threefold, to accommodate up to 200 trains a day. This would have allowed all mainline trains to be diverted from the Warszawska linia średnicowa, the central cross-Warsaw line, to enable major track replacement and brand new stations to be built at Warszawa Zachodnia and Warszawa Wschodnia in time for Euro 2012. Looking at the artist’s sketch of the new station, no one could accuse PLK of extravagance. However, some thought had been given to creating an integrated transport interchange. Four new platforms were to be linked by a new subway to the Metro station of the same name and exits were to be provided to the North and South of the platforms. Work on the new station should have started in 2008. Delays in obtaining the necessary approvals from Warsaw City Council and difficulties in agreeing the phasing the work with the rebuilding of the road viaduct over the railway have delayed the issue of tender documentation. 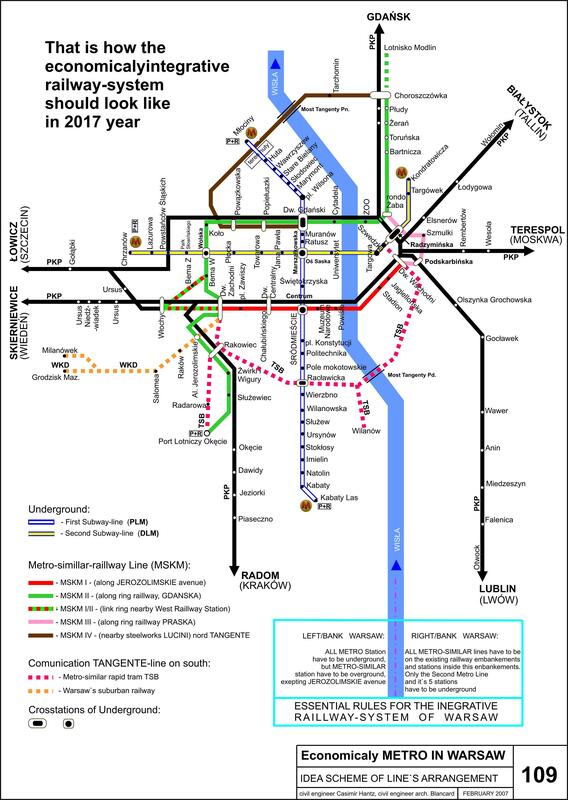 Now with the tenders for the work due in on Monday, the new boss of PLK, Zbigniew Szafranski, has decided that he can only afford to build half the station – two platforms serving four tracks rather than four platforms serving six tracks – so the tender process will be delayed yet again. There is really no long-term need for a six track station at Gdanska, so we applaud the cost saving. At the same time, we see the 2012 completion deadline for building two brand new main line stations in Warsaw slipping away into Never Never Land. Elzbieta Bienkowska, Poland’s Minister for Regional Development, announced towards the end of December that the Government regarded EU-funded infrastructure projects as an important tool in preventing a recession in Poland’s economy, and that some 15 billion zloty would be brought forward for spending on infrastructure projects in 2009 – mainly the construction of motorways. Poland has agreed with the EU to spend 3 zloty on rail infrastructure projects out of every 10 zloty of EU funds spent on infrastructure, so although Bienkowska did not mention rail explicitly, there was reason to hope that there would be a trickle down effect on rail investment. Actually, Poland is barely spending 25% of its EU infrastructure budget on rail, while the Czech Republic and Slovenia are both spending 40%. Anyway, there is now no need to worry that rail won’t be getting a fair share. When Finance Minister ‘Jacek’ Rostocki returned from his extended Christmas-New Year holiday in Britain, he threw a wobbly that Bienkowska had dared to solve Poland’s share of the global economic meltdown without him. He has now come up with his own rescue plan – Poland will need save an additional 20 billion zloty with the majority of the cuts coming from infrastructure projects such as road building. looking at new line to Rugby! On 15 January Lord Adonis, Minister of State in the Department for Transport, made a statement in the House of Lords on the Government’s plans for transport infrastructure. There was much – much too much – about the third runway at Heathroww. There were some nice sound bites about electrifying Britain’s railways, but no firm promises, and the news that the DfT had registered, HS2, HS3, HS4, HS5, etc. at Companies House. In the railways, we are already investing £10 billion over the next five years to add capacity while improving reliability and safety. However, given the time it takes to plan and build new rail infrastructure, we need to look well beyond 2014. Electrification is advantageous on heavily used parts of the rail network. Electric trains are lighter, accelerate faster, are quieter and emit less carbon dioxide. We are well advanced in procuring replacement trains for the intercity routes, but before we finalise our plans, we need to decide whether new parts of the network should be electrified. Initial work suggests that the case for electrification appears strongest on the most heavily used parts of the Great Western mainline from Paddington and the Midland mainline north of Bedford. Alongside the work on our new intercity trains, we will analyse the value for money, affordability and financing options of the electrification proposals that Network Rail will put to me shortly. I intend to make a further Statement later this year. Because of the need to plan for the long term, I can also announce that I am today forming a new company – High Speed Two – to consider the case for new high-speed rail services from London to Scotland. As a first stage, we have asked the company to develop a proposal for an entirely new line between London and the West Midlands, which would enable faster journeys to other destinations in the north of England and Scotland using both existing lines and a new high-speed rail network. Our experience with Crossrail and the Channel Tunnel Rail Link has demonstrated that advance detailed planning is required to progress such major infrastructure schemes. The purpose of the new company will be to advise Ministers on the feasibility and credibility of a new line with specific route options and financing proposals. Sir David Rowlands will chair the company in the interim. I see a strong case for this new line approaching London via a Heathrow international hub station on the Great Western line to provide a direct four-way interchange between the airport, the new north-south line, existing Great Western rail services and Crossrail into the centre of London. My intention is that by the end of this year the company will have advised us on the most promising route or routes, with their individual costs and benefits. As is the custom in the Lords, an informative and polite debate followed the Minister’s statement. But no noble Lord queried why – given that Network rail is already looking at routes for new high speed railways, and Lord Adonis has the whole resources of the DfT at his disposal – he needs to set up a new company to consider the case for new high-speed rail services from London to Scotland. Click here for the whole debate. Dyspozytor is a great admirer of the Fact Compiler. The Railway Eye blog is funny, irreverent and deadly accurate. The Fact Compiler and friends have the same ability to hoover up scraps of waste paper from Marsham Street as BTWT enjoys in Warsaw thanks to our team of top brass table polishers. Here is part of a recent Railway Eye post which made us chortle. Keith Heller, the chief executive of EWS (DB Shenker), Britain’s biggest rail freight company, said that the Department for Transport’s punctuality target for passenger trains was too ambitious and was delaying his freight trains. As DB also runs Chiltern Trains, Wrexham & Shropshire and is a partner in LooRoll, can it be long before Berlin gives Heller ‘das boot’ for this off-message nonsense? We also found the following on Toytown Germany which you also may enjoy. Deutsche Bahn has apologised to passengers after an ICE train arrived at its destination on schedule. The punctual arrival caused severe disruption for passengers usually accustomed to the express trains running anything up to ninety minutes late. Deutsche Bahn defended its record. According to public relations manager Herbert Schwellingwurst, the punctuality was caused by a surplus of staff, balmy weather and completed maintenance works. We are proud that over 97% of our ICE trains run at least five minutes late, but of course we are never complacent and are always looking at ways to worsen our service, he said. Herr Schwellingwurst said that the answer may lie abroad. We are looking closely at the British system, where the privatisation of the railway network has not only drastically reduced the quality of the service, but also massively increased fares. This could well prove to be just what we are looking for in Germany. Can you help? Please write to Dyspozytor at railfan[at]go2.pl (replacing the ‘at’ with an ampersand). ‘A skeletal service will run due to adverse weather. Passengers are advised not to travel.’ Train indicator at Mortlake Station. Photo BBC on-line News. A fall of some four inches of snow caused chaos in South Eastern England on Monday. 1 in 5 people failed to get to work. All London buses were cancelled in the morning. Trains and tubes were cancelled. Schools were closed. Two Eurostar trains became trapped in the Channel Tunnel. Today South East Britain slowly got its act together, but new snow storms spread the chaos to Wales and the South West. It wasn’t always like this. I remember the great winter of 1962-63 travelling as a young schoolboy alone by train from Paddington to Leamington Spa. It was really cold and as we crossed the GW&GCJR viaduct at Denham I could see icebound narrowboats trapped on the Grand Union. But the trains and Underground ran almost normally. Nobody dreamt of saying ‘Passengers are advised not to travel’. My parents were quite confident that I would arrive on time at my destination. Britain was a different country in those days and the railways were run by railwaymen and not ‘managers’. Rail pundit Christiam Wolmar picked up the same theme in his blog, What is missing is the old ‘the show must go on’ Windmill spirit. The spinelessness is reflected elsewhere, too: Camden’s parks are all closed for safety reasons and the government building where my daughter works was threatened with closure because not enough security staff had got through the snow. Network Rail has chosen Rick Haythornthwaite, to be its next chairman. Haythornwaite will take over from Sir Ian McAllister, who was strongly criticised after engineering overruns in the 2008 New Year period caused massive disturbance to customers. McAllister also faced widespread criticism over the size of bonuses paid to senior directors. At the Network Rail AGM in July this year, the members of Network Rail voted in favour of undertaking a review of the corporate governance of the organisation and McAllister revealed his plans to step down. Rick Haythornthwaite graduated from Queen’s College, Oxford, with an honors degree in geology and subsequently completed a Masters degree in Business Management at MIT. He began his career as a geologist at BP. Over a period of 17 years, he served the company in several capacities, including as general manager of the Magnus Oilfield and as president of BP in Venezuela. He was a Corporate and Commercial Director of Premier Oil plc from 1995 to 1997, and thenworked as Chief Executive of cement company Blue Circle. In 2001 he became Chief Executive of engineering conglomerate Invensys and served in that capacity until 2005. Haythornthwaite is a managing director at STAR Capital Partners, an independent investment fund management company, and he is the chairman of MasterCard Inc.
Haythornthwaite is also chairman of the Better Regulation Commission, an independent body that advises the British government, and he serves as a non-executive director at ICI. He is a member of the MOT Leadership’s Centre advisory council. He is chairman of the Almeida Theatre Company and of the Tate Gallery’s Corporate Advisory Group. He is also on the board of the British Council.